It wasn’t too long ago that I met a complete stranger named Sarah, and she wasn’t a Hendricks County or even an Indiana resident. However, sitting next to her knitting away mid-day made me feel like we were neighbors. She opened my eyes to the possibilities in business travel. Now, my husband travels a great deal; no, he travels a lot. And I know he has blank hours where he sits in hotel rooms or diners and is bored. Sarah did, too. That is, she did until she took up knitting. In her off hours, between appointments in the various towns and cities she visits, she goes to the local knit shops. There’s something homey and welcoming in knit and yarn shops that she says is a welcome feeling on the road. 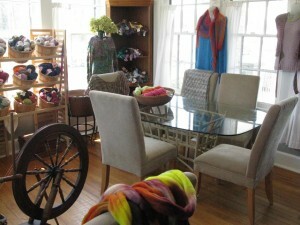 Here in Hendricks County, we have one of the neatest little yarn shops. 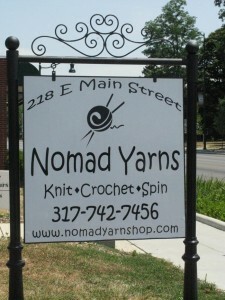 It’s called Nomad Yarns and it’s at 218 E. Main St., Plainfield. The proprietress, Erica Kempf, is a Hendricks County native who returned after several years off around the world in another career. 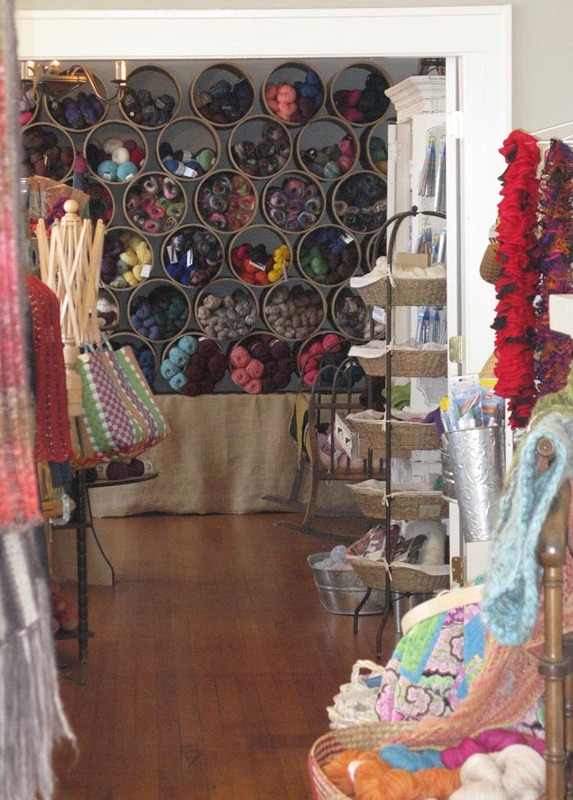 Her story and her yarn shop are both delightful, and she’ll share both with visitors. The shop is within minutes of the Indianapolis International Airport, too! The shop that is celebrating its second anniversary on July 28 has become the center of Hendricks County yarn arts with classes and groups who gather to share stitches and patterns and chat. Often, someone will bring in treats to share, too. It is just like gathering with friends in your living room. The people (men, too!) come in all ages and backgrounds. Knitting is definitely not reserved for little old ladies anymore! Not just travelers, but moms seeking a few minutes of quiet solitude can spend time at the shop after dropping off children to play at the Splash Island Family Waterpark just a few minutes away. The conversation is light and lively and filled with laughter on Thursday evenings. I am usually concentrating really hard because my fingers and stitches are not swift and automatic, and I admire the ease of how others stitch and the beautiful things they all create. It isn’t just knitting that’s a’ happening here. No, there are people who crochet and spin and make lace, too. Erica assures me that these are all skills most everyone can accomplish and she’s set up a special classroom where she teaches classes to give people that opportunity. Believe me, she has LOTS of patience – I know I take a lot of it! I just love her shop, and I know anyone who has an ounce of desire to create with yarn and natural fibers will love it, too. 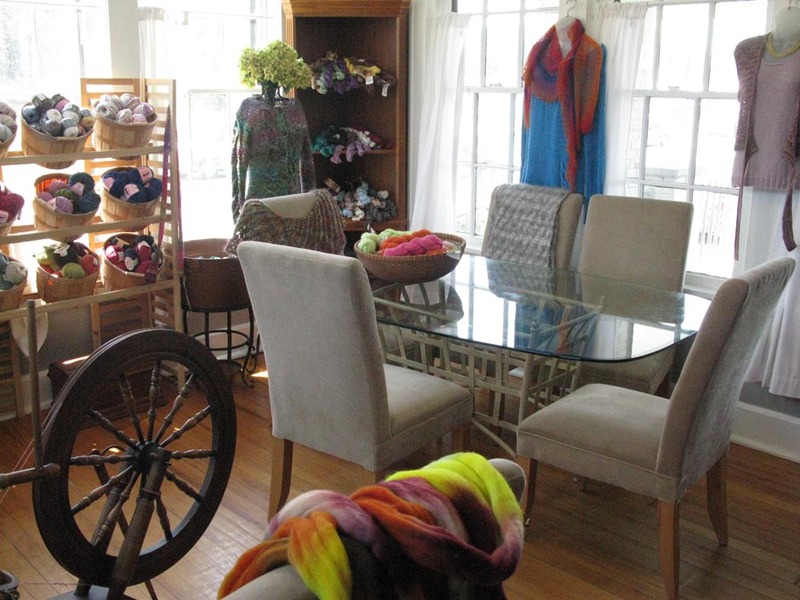 You should stop in – she has everything you will need to get started – including a place to spend 15 minutes or two hours quietly creating your own fiber masterpiece.